Do you need documents notarized? Do you have a tenant-landlord issue? Are you looking for advice on a legal matter? 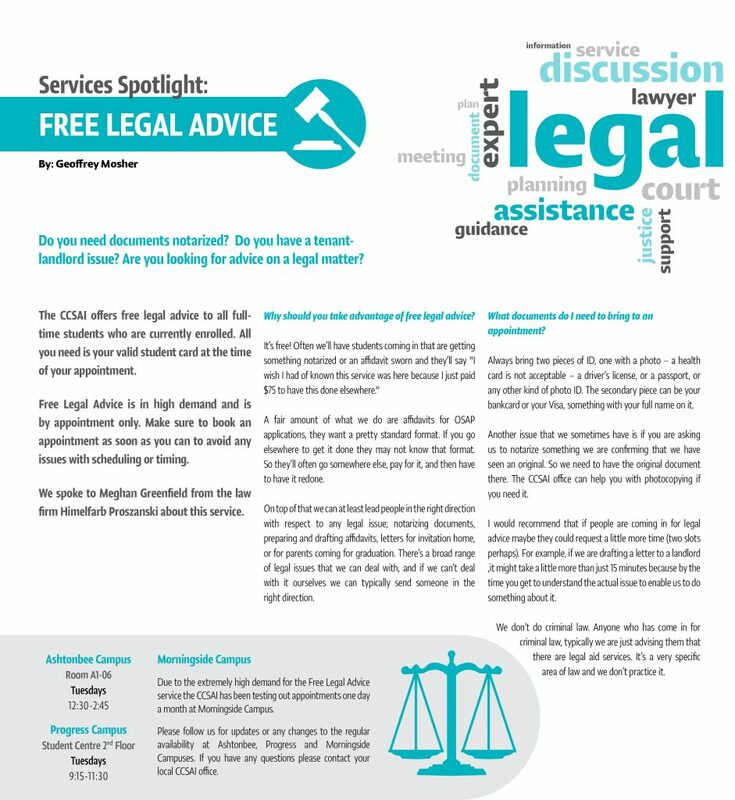 The CCSAI offers free legal advice to all full-time students who are currently enrolled. All you need is your valid student card at the time of your appointment. Free Legal Advice is in high demand and is by appointment only. Make sure to book an appointment as soon as you can to avoid any issues with scheduling or timing. We spoke to Meghan Greenfield from the law firm Himelfarb Proszanski about this service. 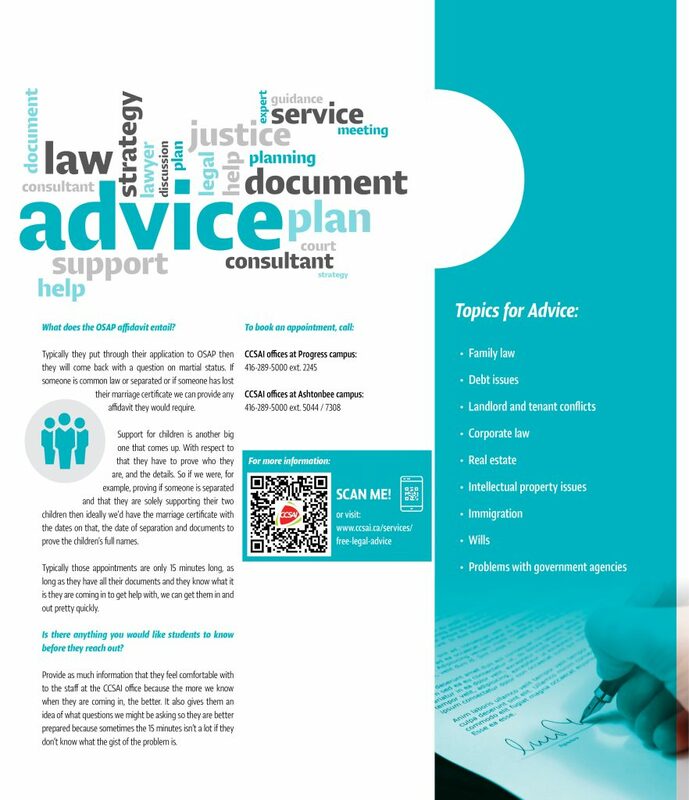 Why should you take advantage of free legal advice? A fair amount of what we do are affidavits for OSAP applications, they want a pretty standard format. If you go elsewhere to get it done they may not know that format. So they’ll often go somewhere else, pay for it, and then have to have it redone. Always bring two pieces of ID, one with a photo – a health card is not acceptable – a driver’s license, or a passport, or any other kind of photo ID. The secondary piece can be your bank card or your Visa, something with your full name on it. I would recommend that if people are coming in for legal advice maybe they could request a little more time (two slots perhaps). For example, if we are drafting a letter to a landlord, it might take a little more than just 15 minutes because by the time you get to understand the actual issue to enable us to do something about it. We don’t do criminal law. Anyone who has come in for criminal law, typically we are just advising them that there are legal aid services. It’s a very specific area of law and we don’t practice it. What does the OSAP affidavit entail? Typically they put through their application to OSAP then they will come back with a question on martial status. If someone is common law or separated or if someone has lost their marriage certificate we can provide any affidavit they would require. Support for children is another big one that comes up. With respect to that they have to prove who they are, and the details. So if we were, for example, proving if someone is separated and that they are solely supporting their two children then ideally we’d have the marriage certificate with the dates on that, the date of separation and documents to prove the children’s full names. Typically those appointments are only 15 minutes long, as long as they have all their documents and they know what it is they are coming in to get help with, we can get them in and out pretty quickly. Is there anything you would like students to know before they reach out? 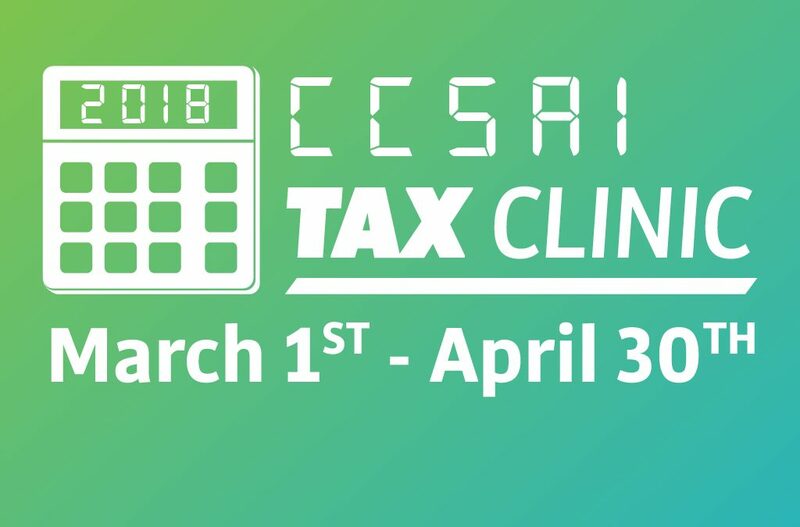 Provide as much information that they feel comfortable with to the staff at the CCSAI office because the more we know when they are coming in, the better. It also gives them an idea of what questions we might be asking so they are better prepared because sometimes the 15 minutes isn’t a lot if they don’t know what the gist of the problem is.